With only 40 exclusive apartments decadently spread across three towers, the Merano Residences boasts some of the most intimate living space in the largest regeneration of a Central London area since the development of Canary Wharf and the Docklands. £7.00 – £7.50 per sq. ft.
Total of 13 spaces available. Underground – Less then 500m is Vauxhall Station, giving access to the Victoria Line in 4 minutes serving Kings Cross and the West End. Two proposed new Northern Line Stations will link to the city and Leicester Square by 2018. Train – Vauxhall overground is less then 50m offering mainline links to Clapham Junction, Waterloo, Victoria and the South of England. Bus – Albert Embankment currently has 1 bus routes which will take you to the heart of the city in 30 minutes, and there is a main bus station at Vauxhall station with Bus routes all over London. Riverboat – Services run every 20 minutes during peak hours from Westminster which is 1.2 miles away, to London Bridge and Canary Wharf. A new River bus Pier is to be built at St George Wharf. Air – London’s main international airports are all located within an hour from Merano Residences. The apartments, made up of one, two and three bedroom flats and a selection of duplex and triplex penthouse apartments offer a variety of layouts while maximising the use of space and natural light. This Rogers, Stirk, Harbour & Partners designed development has been so meticulously planned that each residence occupies at least one whole individually coloured bay of the three towers. 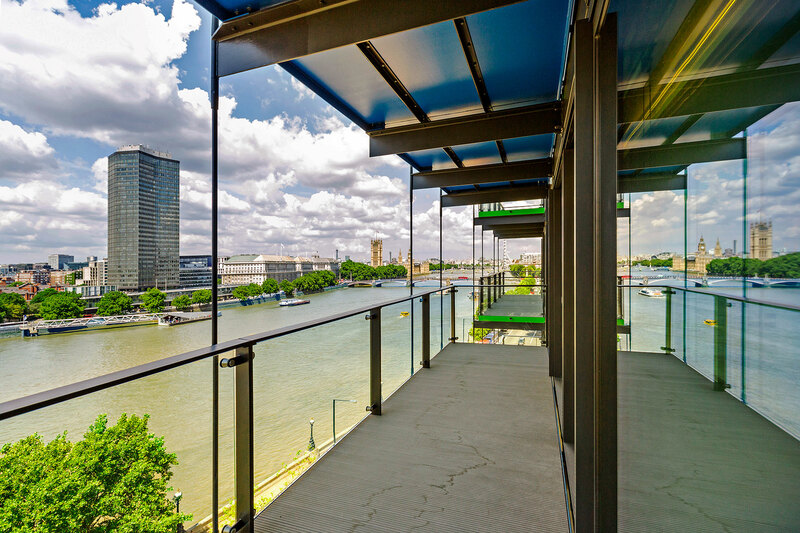 With living spaces and balconies overlooking the Thames and benefitting from stunning views of London’s most famous landmarks The Merano Residences have been described as being: ‘admired by many but home to only a few’. Merano Residences reflects a sea change in London living and architecture. Since medieval times The River Thames has understandably been regarded as the major method of industrial transportation and as a result its banks have always been occupied by industrial and commercial buildings. Uninspiring to say the least, the Albert Embankment an area which stretches for approximately one mile between Lambeth Bridge down to Vauxhall Bridge is now part undergoing one of the most exciting and extensive riverside developments of recent years. Previously the site of Merano Residences was known as Eastbury House, a drab, 1960’s government building. Eastbury House is perhaps representative of a less affluent, forward thinking London that was going through its own period of uncertainty. The Swinging 60’s that London was so famous for never quite swung in Lambeth, according to former Prime-Minister John Major. One can easily image a young, grey suited civil servant sitting at his desk in Eastbury House looking out over the Thames towards the West End and realising that perhaps life was happening elsewhere. However, life is now happening right here, in Vauxhall, in Nine Elms and residents of the Merano will only need to step out from the impressive foyer to realise that they are part of the newest, upcoming area of London. Touted as London’s freshest hub for culture and commerce, Nine Elms will be a mix of private residences, commercial premises and cultural venues. To the rear of the Merano development, world famous artist, Damian Hirst is launching a new gallery, housing both his own works and a personal art collection to rival Charles Saatchi. The Merano is likely to appeal to those who require a discreet yet central and secure home. Those who live and work full-time in London or who are seeking a contemporary riverside home in one of the World’s leading capitals will also be attracted to the development. The global elite are also looking towards London as a central hub, with its international airports, financial centre and world class cultural venues. Functional, stylish design is at the heart of the Merano Development. Designed by Rogers, Stirk, Harbour & Partners every detail has been considered in making the Merano one of London’s most desirable residences. Interior designers, Martin Goddard & Jo Littlefair have chosen interior specifications that meet the demanding tastes of today’s well-travelled international buyers. Having designed many 5 star hotels and residential developments Goddard Littlefair use their expertise to combine hotel standards of efficiency with individual home comforts. Specifications include; fully integrated Siemens and Miele kitchen appliances, timber engineered flooring, wine cooler, comfort cooling to bedrooms and living areas, energy efficient heating and hot water control centre and full height internal doors. At the build stage purchasers will also have the opportunity to choose from a selection of interior finishes put together by Goddard Littlefair to enable buyers a bespoke fit out to their apartment. How light flows throughout the building has been a key consideration. With that in mind every apartment takes up at least one whole bay meaning that all occupiers benefit from the maximum amount of daylight from morning sunshine to naturally awaken you to stunning sunsets for you to admire in the evening. Given the central location of the Merano Residence, it would be easy to list the sights and attractions such as Tate Britain, (which the Merano is opposite), the world famous South Bank, shopping on Sloane Square etc. All of which are a pleasant walk, short bike ride or even shorter taxi ride away. Vauxhall transport hub is also just a few minute’s walk way providing easy access to all of London’s central districts. As the previous history of the Merano Residences site shows, It may not have been swinging in the 1960’s but Vauxhall and Nine Elms Certainly is now! One can easily imagine the Beatles or the Rolling Stones having an apartment in the area and people strutting from bar to bar dressed in Mary Quant and Biba. London’s most stylish crowd are populating South London like never before with once run down areas being revitalised into vibrant and affluent social hangouts. While residents of the Merano, may be more familiar with the international jet-set and the usual global brands found on the nearby Kings Road it is actually Brixton Village Market, and the Boutiques and cafes of Peckham that are the stomping ground for London’s coolest hipsters. Crowds regularly queue for arguably the best pizza in London outside Franco Manca’s in Brixton Village Market or checkout the designer treats at Circus, a shop whose displays are made entirely out of cardboard. On Bermondsey Street number 167 an independent menswear boutique and gift-shop attracts design lovers it being run by former Burberry designer Michael McGrath, then at 214 Bermondsey Street (admittedly vendors on Bermondsey street seems struggle with naming their premises!) this basement bar has become the sweetest spot for gin cocktails, it’s friendly unpretentious atmosphere being infinitely more welcoming than anything made in Chelsea.